Imperfectly Painted: Ever feel stuck in a nail polish rut? I know I must sound insane. I have over 300 bottles of polishes and the idea of me getting bored with the collection I have sounds ridiculous. Well, it is ridiculous, but it happens. I must say lately when I want to paint my nails I get stuck. I have no idea what to choose from, what color family I want to wear, and various other things. Then I remembered the beauty of layering polishes. I think I may lost it a bit, but my very first real post on this blog was about layering after that i just kind of forgot about it. Layering polishes was something I did regularly. I guess I got caught up doing swatches of various colors that it slipped my mind. I must say layering has taken me out of my nail polish rut. There are endless combinations with layering. You can create subtle effects or completely change the look of nail polish color through layering. The sky is the limit! 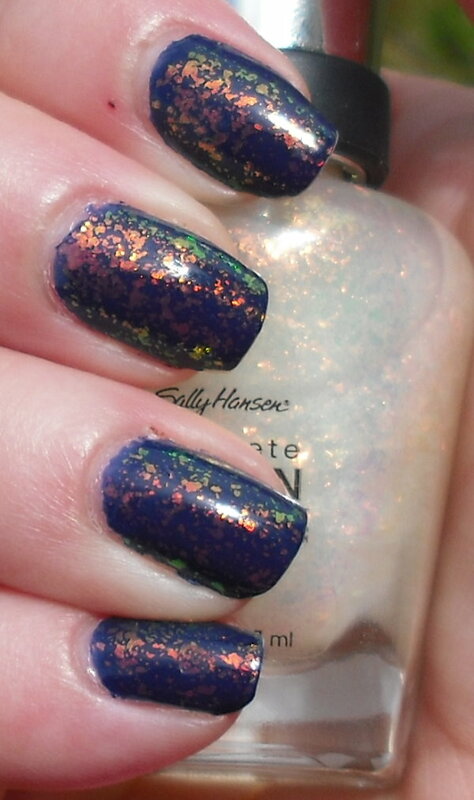 Here was my most recent manicure using Sally Hansen Hidden Treasure (I hope you're not tired of this one!) over Orly La Playa. Please excuse my little boo boo on my index finger. I had a hangnail :(. Dear Sally Hansen thank you so much for this beautiful Hidden Treasure! I can't say that enough. What a great unique polish that I am so happy to have. This thing looks amazing on anything, but it was my first time trying it over a dark color. It really pops and looks great! 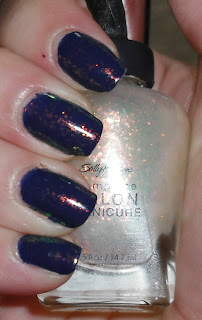 Orly La Playa is an gorgeous dark blue creme too. It's a lovely combo! Do you like to layer over polishes? What are some of your favorite layering polishes? I love layering. I generally change my nails every day but if I'm feeling lazy, I'll just layer a shimmer or glitter over top for the second day. I should layer but I keep forgetting. Thanks to you I just sloshed some CG Fairy Dust over a glitch on my RH middle. MUST LAYER MORE. I totally know what you mean, it's like we have so many colours it it overwhelming! love the mani, will have to try this out some time, I have both polishes. I'm a layering junkie, too. I've got two Melmer drawers full of sheers and glitters. Skulda- Thanks! Nail wheels would be a great way to test out layering. Michelle- That's a great tip I've done too. I don't feel like changing my mani, but want something different, layering is the perfect solution! Shiny- Nfu-Ohs are amazing! I've seen those CND effects too very cool! Freshie- Oooo what a great description of HT! Very true. jaljen- Yes must layer more. I love ChG Fairy Dust! Danielle- I think you're right it is just too overwhelming. I'm feeling opposite of you. I can't decide what to wear because I have so many ideas I don't know which to do first! 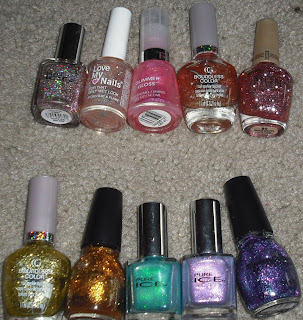 I only have about 90 bottles of polish but I swear I can never decide what color to wear, lol.